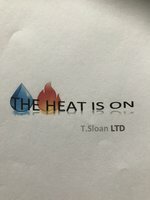 Hi my name is Tom Sloan, I am the owner of 'The Heat Is On' which is a family run buisness based in Windsor Berkshire. I have been a Gas Engineer over 15 years and my company install Worcester products on a weekly basis which has lead me to become an accredited member with Worcester Bosch. We are fully insured and specialise in Boiler installs, Servicing, Maintanence and Underfloor heating. We offer an extremely reliable and friendly service and pride ourselves on doing the best job we possibly can We look forward to hearing from you, we offer quote services at weekends/evenings or a time to best suit you. I had an issue with my boiler, Tom was recommended to me - he tried his best to help me with the issue over the phone which temporarily fixed the problem. I asked Tom to come and take a look when the problem recurred, he fixed the problem, gave me some honest advice and was extremely helpful. I will use these guys in future and would recommend them to anyone. Tom installed a new Worcester-Bosch combi boiler in my flat, and removed the existing boiler, tanks and piping. He was helpful and proactive, with valuable suggestions, when agreeing the spec. He was incredibly easy to deal with - he phoned precisely when promised, he and Jack turned up on the dot to start work, and they left my flat such that you wouldn't have known they had been. The work was completed within schedule and agreed price. They discovered a slight leak that my previous maintenance company should have spotted, but fixed it at no additional cost. Nothing has gone wrong, and if it does I am confident Tom will fix it. A first rate job. Following the most reasonable of several quotes obtained for the work, Tom and his able and well trained young assistant Jack installed a new Worcester Bosch boiler for us. The job included a new, long 22mm copper pipe across the loft from the gas meter to the boiler. This work was carried out very quickly and efficiently and the system was flushed, filter and inhibitor added, commissioned and working well by 4:00PM the same day. Amazing!! I cannot recommend these friendly, polite and likeable guys too highly! Fantastic service - this team cares. When I called, Tom suggested ideas that could help without any cost. He gave a quote, committed to calling me. He called, arrived and did a great job - he cared about making sure everything worked, not just fixing the fault. Fantastic service. Installation of Combi boiler and chemical flush. Tom has previously completed radiator replacements and upgrades for us. Tom provided a solution what worked as promised and delivered exactly what Tom said it would. Since i have had 2 tradesmen in the loft one to check pipe work going into upstairs bathroom, and another checking water pressure after a radiator was removed for a room to be decorated. Both have always commented on the quality of Toms pipe work and installation, i think this is the best compliment to Toms work. If you are considering any kind of heating work, You should 100% consider Tom, because he delivers what he says, sees projects to the end, and 100% knows what hes doing and is a properly good guy. Thank you. We first used Tom 3 years ago to put in a new boiler, currently he did an annual check on the boiler. Tom is absolutely excellent, very reliable and very helpful. We initially chose him out of a couple of different quotes we had and are very happy that we did, it was a good price and he did a great job. He is very tidy and doesn't make a mess. We would continue it use his services, he is that good. We would highly recommend his services to anyone. We decided to go with Tom after he came around to do a quote and he talked us through everything. He changed our boiler and put in new radiators he is a very genuine person, offered a good price. I am happy with the work, really pleased with what he did. Very tidy and clean worker. I already recommended him to some other people who have used him.